Blue Jacket fans can expect more, lot’s more. Four more days until the National Hockey League trade deadline and General Manager Scott Howson is at it again. After sending Antoine Vermette to the Phoenix Coyotes yesterday afternoon, today he dealt Jeff Carter to the Los Angeles Kings in exchange for defensemen Jack Johnson and a conditional first round pick in either 2012 or 2013. In what began yesterday as the official overhaul of the Blue Jackets player personal, management will continue to load up on draft picks for the upcoming draft in Pittsburgh and attempt to add promising, young prospects to the organization. In today’s deal though, Columbus lands Indianapolis native Jack Johnson. A 6’1 230 pound defensemen. A former first round pick of the Carolina Hurricanes (3rd overall) in the 2005 NHL entry draft. Johnson will join the Blue Jackets after posting eight goals and 24 points this season in Los Angeles. In 343 NHL contests, Johnson has compiled 30 goals and 124 points.The US born defensemen also has an Olympic Silver Medal from the 2010 Winter Olympics. “Iam excited by this,” Johnson said. “I’m excited to go to a sports team that wants me and to play in a great sports city. 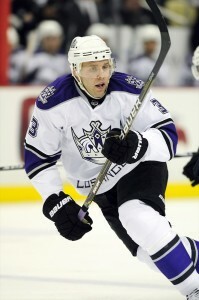 In 2011 Johnson signed a seven-year contract extension with the Los Angeles Kings. An annual cap hit of $4,357,143. As for the reuniting of Jeff Carter and his best friend Mike Richards, it’s a great day for both as they will wear the same jersey again after two separate block buster trades occurred last year ending their playing days together in Philadelphia. Carter appeared in 39 games this season with the Blue Jackets. He found the back of the net 15 times and added 10 assists. It didn’t work out though, as Carter simply couldn’t find the positive edge to play in Columbus. And with that, the 27 year old center will head to LA with his 11-year contract worth US $58 million. Stay Tuned for all the latest breaking news coverage as the NHL trade deadline clock is ticking.